The Godfather tricks you into rooting for some very bad people. You accept the Corleones because they love each other as family, and because they are ruled over by a seemingly fair, loving, generous, and successful patriarch. 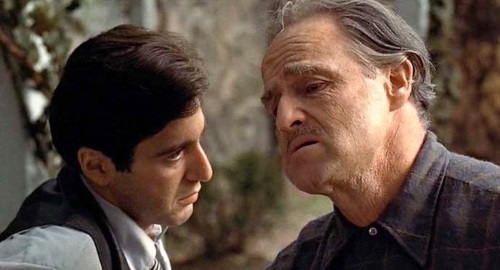 That patriarch, Don Vito Corleone, helps the community, plays with kittens and his grandchildren, and reminds his reckless and impulsive eldest son that “a man who doesn’t spend time with his family isn’t much of a man.” But this warm and sweet old man made his fortune, and continues to enlarge it, in crime. Vice, violence, and even murder are part of his successful business strategy. I first saw The Godfather in the spring of 1972, during its first run engagement. I loved it from the start, although it took a few years for me to realize just what a breathtaking masterpiece it is. It easily makes my A+ list of films that I have loved for decades [12/14/2015: Changed URL]. To make the grade, it must be the perfect embodiment of its genre or stand beyond genre. It must be at least 20 years old, so I know that it’s stood the test of time. For the few reading this who haven’ seen The Godfather, this sweeping crime epic tells the story of a high-level but aging mafia boss (Marlon Brando) who passes his crown to his youngest and smartest son, Michael (Al Pacino in the role that made him a star). At the beginning, Michael is a warm, sweet guy who loves his family but wants nothing to do with the business. His WASP girlfriend Kay (Diane Keaton) signifies his movement away from Sicilian values. But incidents beyond his control (well, maybe) drive him into the family business. And as he proves to be extremely capable at that business, his blood turns to ice water. The warmth that made you like Michael, and made you forgive Vito despite his sins, disappear entirely in the new Michael. The screenplay by Mario Puzo (based on his novel) and Francis Ford Coppola (who also directed) gives us time to meet the family and drink in the atmosphere. A long wedding scene early in the movie introduces most of the main characters, with Kay playing the outsider who becomes the audience’s surrogate as she’s introduced to her boyfriend’s family. Then the action moves from the East Coast to Hollywood for a self-enclosed subplot that doesn’t push the story forward but gives us an idea of how the family operates. The main story–involving the new drug trade (the film is set just after World War II)–begins more than 30 minutes into the story. And that is absolutely the right pacing for this story. Coppola and cinematographer Gordon Willis (known in the business as “The Prince of Darkness”) create an atmosphere that’s both noir and epic, with powerful contrasts of dark and light. In the first scene, the Don meets with various people on business in his dark and shadowy office, while his daughter’s wedding outside gleams with joy and sunlight. These contrasts continue throughout the movie, especially when a crime war runs darkly through the streets of New York while Michael hides in the beautiful, sun-swept mountains of Sicily. The Godfather is filled with remarkable set pieces. There’s the opening scene where a local undertaker begs the Don for justice he could not get from the courts. There’s the hospital sequence, when Michael has to think fast and bluff armed gunmen to save his father’s life–and then realizes with surprise that his hands aren’t shaking. There’s the climatic baptism scene, where Michael at the church alter repeatedly renounces Satan while his henchmen rub out his real or imagined enemies. But my favorite is a very subtle one. Michael and Kay come out of a movie theater and flirtatiously joke with each other. Then they disappear behind a newsstand. When they reappear, Kay’s face reflects some very bad news that Michael hasn’t seen. The title The Godfather could refer to either the Don or Michael, and their fate are clearly intertwined. Vito became a criminal so that Michael and his three siblings could lead a better life. But his decision eventually destroys all of them, either literally or spiritually. I’ll discuss more of that in my next A+ article, on The Godfather, Part II.